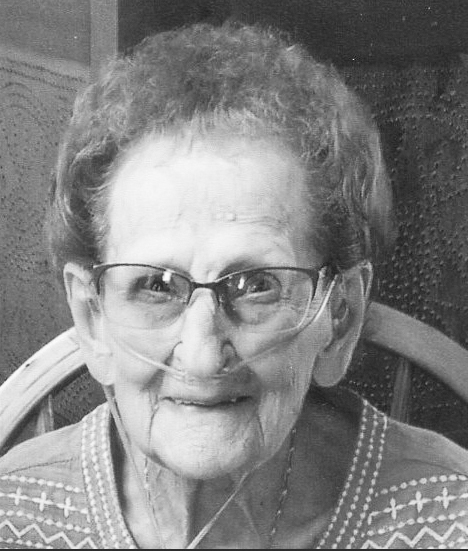 Edith Virginia “Polly” Alt, 93, of Petersburg, passed away Wednesday, Feb. 6, 2019, at Grant Memorial Hospital in Petersburg. She was born Oct. 25, 1925, in Petersburg, and was a daughter of the late Thomas William Cox and Elizabeth (Mongold) Cox. In addition to her parents, “Polly” was preceded in death by her husband, Forest D. Alt on March 31, 2014 after 67 years of marriage; also preceded by two sisters, Mary Mauzy and Annalee Bible and one brother, Junior Cox; two brothers-in-law, Ronald Mauzy and Wardnie Bible; and sister-in-law, Faye Cox. “Polly” was employed by Windsor Knit Sewing Factory, Joan Curtis Manufacturing, Edinburg Manufacturing and was manager and retired from Schwab (Little Me Clothes) Manufacturing. She was a faithful member of Grove Street United Methodist Church. “Polly” was a member of the American Legion Post 64 Ladies Auxiliary and member of the Rebekah Lodge of Petersburg. “Polly” is survived by two daughters, Sharon (Tim) Cooper of Elkins and Brenda (Rick) Feaster of Petersburg; one son, Terry “Buddy” Alt of Petersburg; six grandchildren, William “Christina” Umbright of Morgantown, Thomas (April) Rohrbaugh of Petersburg, Beverly (Brian) Romero of Elkins, Beth (Tommy) Scott of Oakland, Maryland, Jeff (Alyssa) Feaster of Weirton and Morgan Heavner of Petersburg; 17 great grandchildren, Codie Rohrbaugh and Brooklyn, Samatha Rohrbaugh, Josh and Macie Romero, Julia, Natalia and Austin Feaster, Tommie, Sidney, Sunni and Sadie Scott, Tyler and Katie Umbright, Chasity Alt, Blake Heavner, Hunter Heavner and Addison Heavner; one great-great grandson, Benjamin Creed Rohrbaugh; one sister, Nancy (Les) Given of Charlotte, North Carolina and one brother, Wayne Cox of Manassas, Virginia; sister-in-law, Kay Cox of Winchester, Virginia, and several nieces and nephews. Friends will be received from 6-8 p.m. Saturday, Feb. 9, at the Schaeffer Funeral Home in Petersburg. Funeral service will begin at 2 p.m. Sunday at the Schaeffer Funeral Home Chapel with the Rev. Larry Hakes and Pastor Yvonne Black officiating. Burial will be in Lahmansville Cemetery. Family suggests that memorial donations may be made to Grove Street United Methodist Church, 4 Myrtle Ave., Petersburg, WV 26847.